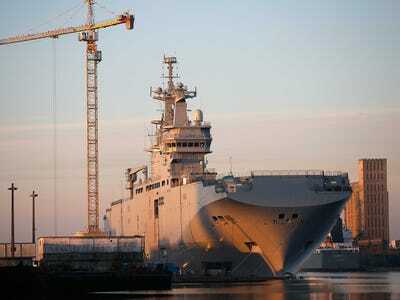 REUTERS/Stephane MaheThe Mistral-class helicopter carrier Vladivostok in Saint-Nazaire shipyard. Russia has given France until the end of November to deliver the first of two Mistral-class helicopter carriers currently stuck in a shipyard in Saint-Nazaire, according to reports. The ship, the Vladivostok, was scheduled to be delivered on Friday but that deadline is now certain to be missed. In response a senior Russian source told state-owned news service Sputnik International that the French side now have until the end of the month to hand over the ship or the whole deal could be in jeopardy. “We are preparing for different variations. We’ll wait until the end of the month, and then we’ll make serious claims,” the source told Sputnik. Since the onset of the Ukraine crisis the French government has agonised over the €1.2 billion contract. After tense negotiations France succeeded in getting existing contracts excluded from the European Union’s package of sanctions against Russia over its role in supporting rebels in eastern Ukraine. However, with the original deadline for the handover of the Vladivostok fast approaching Hollande imposed two conditions necessary for the sale. These were a ceasefire that was being observed by all sides and tangible evidence of progress towards a political settlement over Ukraine’s future. Despite reaching a ceasefire deal in September, the failure of both sides of the Ukraine conflict to stick to it has so far prevented the French president’s conditions from being met. Reports on Wednesday from NATO that Russian troops and artillery have been moving into the country may have finally extinguished what little hope France held that the deal can be salvaged.